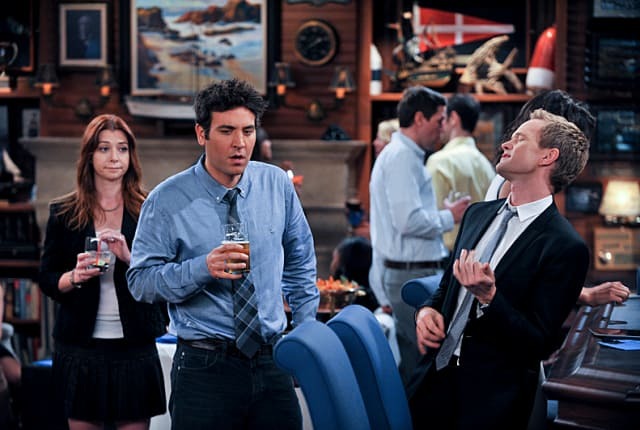 Watch How I Met Your Mother Season 9 Episode 12 online via TV Fanatic with over 7 options to watch the How I Met Your Mother S9E12 full episode. Affiliates with free and paid streaming include Amazon, iTunes, Vudu, YouTube Purchase, Google Play, Hulu Plus, and Verizon On Demand. Lily is upset with Ted over a promise he made while Barney vies to play laser tag at the rehearsal dinner on How I Met Your Mother. Robin: Take a good look at this face Barney OK? Cause it will be useful for the future. This is my pretty mad face. Barney: Well then we've got a problem, cause it looks a lot like your pretty hungry face. Robin: I'm missing the bacon wrapped figs! Permalink: I'm missing the bacon wrapped figs! The no more surprises thing is the best part of being married. Permalink: The no more surprises thing is the best part of being married. How I Met Your Mother Review: Surprise!